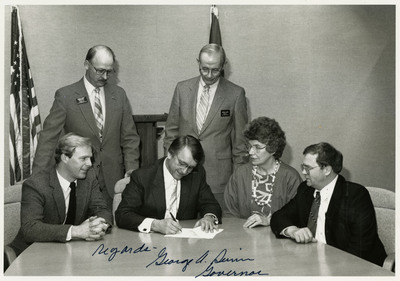 "North Dakota Governor George Sinner signing Legislation"
Rosemarie Myrdal witnessing North Dakota Governor George Sinner signing legislation. Four unidentified men are sitting at the table watching the governor. A Democrat from Fargo, George A. Sinner began his political career in the North Dakota Senate, serving from 1962 to 1966. He then became a delegate to the North Dakota State Constitutional Convention in 1972 before serving one term in the North Dakota House, 1982 to 1984. He was elected North Dakota's 29th Governor and served from 1985 to 1993. Rosemarie Myrdal was elected to the North Dakota House of Representative in 1984 to represent District 11 (Pembina and Walsh counties) until 1993. A Republican from Edinburg, she served as Lieutenant Governor from 1993 to 2001.